Bass Player, Multi-instrumentalist, Arranger and Musical Producer. 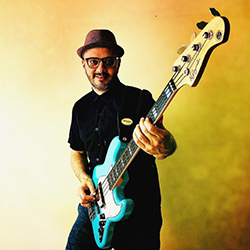 As a Bass Player: Dunga has worked with great Brazilian names, such as Ivan Lins, Gilberto Gil, Milton Nascimento, Lulu Santos, João Donato, Marina, Seu Jorge, Adriana Calcanhoto, Ana Carolina, Marisa Monte, Maria Bethania, Zelia Duncan, Ney Matogrosso, Cassia Eller, Claudinho e Buchecha, Banda Eva, Martinho da Vila, among others. As Musical Producer: Dunga has worked with Ana Carolina, Zeca Baleiro, Leo Jaime and Jay Vaquer.